THIS IS AN ANTIQUE ORIGINAL VICTORIAN CAST IRON WALL MOUNTED SWIVEL OIL LAMP WALL SCONCE ALONG WITH THE ORIGINAL OIL LAMP. THE TWO ORIGINAL SCREWS TO HOLD THE CAST IRON OIL LAMP BRACKET. ORIGINAL OIL LAMP BRASS BURNER MARKED ELDORADO AND W.B.C. CORP. (CORPORATION) ON THE ROUND BRASS OIL LAMP WICK KNOB. They are untested. I have never seen another set like this, I couldn't find any indication as to who may have made them. They need cleaned ! They are very heavy. NOTE - these are one piece wall plates with extension arms only - they are unwired, with no bulb fixtures and they would need bulb seats to look normal. Not sure if they have been stripped or were never fully assembled, but SOLD AS IS AS FOUND, as restoration pieces. 2 ANTIQUE SCONCES 2L EA. 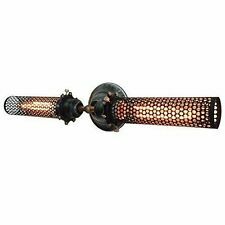 REWIRED COLLECTIBLE SCONCES 16X10X5 IN. DIA. BACK EXC ! 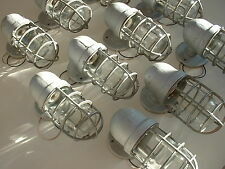 Crouse Hinds Explosion Proof Light. The main potions of the light are cast iron, the 911 globe-guard is aluminum. The embossed Crouse Hind V75 globe is perfect. This is the smaller 100 watt size Crouse-Hinds sconce light. Decorative Torch Sconces (Two) Used VG . Photo #1 is an example of a powder room installation of similar fixtures. 17-1/2" Tall. Very good condition. SOLD AS IS AS FOUND, as restoration pieces. 1950s swedish diablo wall lamp by Asea in brass & black matté paint - in the manner of Vilhelm Lauritzen n' Paavo Tynell. Maker/designer: Asea. Type: flexible - fully adjustable wall lamp - bedside light - sconce. Gothic Dragon carved. Gorgeous antique Wood carved wall sconces. Exclusive pieces for your wall. rare & very collectable. 10 1/2" x 6 1/2" wide. Producer: Lyfa. Type: Flush Mounts or wall lamp. Period: 1970s. Model: 4441. VERY UNIQUE ANTIQUE CRYSTAL LIGHT CHANDELIER. Very regal detail in beautiful kept condition. Wear typical of age and one may wish to polish, but they truly don't need a thing. Maker/designer: Heifetz Rotaflex. Type: wall lamp light sconce. Design period: 1950s - early 1960s. Origin: France. Don't let these pass you by!appraised at 650.00. bin 349.00. These are very unique and very elegant. Deep carvings with beautiful ornate acanthus leaf detail. Overall they are sensational in a grand size and most certainly would be the focal point in any room. 2 quality 2L EA. can be hung on a nail or screw until installation.they would hang temporarily on the top loop nicely. 20 lb box. don't let these pass you by! Sperti Sun Lamp Model P108. Converted to a wall sconce. If you prefer to mount this to a sconce wall box. I will cut the switch off and shorten the cord so it can be. The Miami. Mounts anywhere to the wall with a screw. Rare Pair of late 19th Century French Antique Wall Sconces - in the form of baskets with an overflowing floral motif. The original fixtures that are the furthest flowers ahead of the baskets are intact, however, these units would require re-wiring to utilize as electric lights. 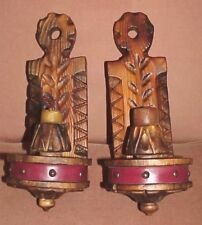 Pair of Hand Carved Hardwood Renaissance Revival Electric Wall Sconces Circa 1950. 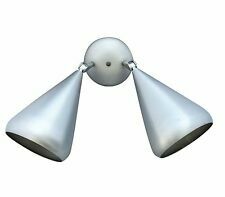 This rare and unique pair of sconces are now available to the general market. This hand carved pair are also one of a kind. Everything is more beautiful in candlelight! A great wedding, anniversary or housewarming gift! There are no electrical wires present. There is minor wear present however there are no breaks or repairs. Units have a clear laquer coating.fronts have no fine scratches.the backs are silver plated as well. 3-4 years-then they are let go-to die of aids eventually.they have a high quality large campus,chaing-mai-u.n. guarded to heal -to learn trades-any religion they want to practice. Back plates are 9" long and 4 1/4" wide - total width on the two bulb fixtures is about 8" including the bulb seats, total length is about 10 1/2" and front-to-the-wall depth is about 3 3/4". Oxidized white paint, dust, cobwebs, etc. Plastic inserts. Then we'll both be happy ! 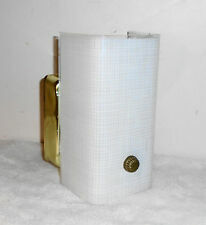 A beautiful movable wall sconce of the finest quality-made in france 1950's. Looks like they were from a large public building and are Fake gas fixtures ,probably from the 50's. All Brass with holes around the bottom of each light head to hang prisms. All fitter screws missing. It’s difficult finding 3-arm sconces. To find a pair would be impressive enough, but four?. I’m unsure how old the sconces are but estimate that they were made between 1905 and 1925. The sconces do not mate with standard mounting brackets.